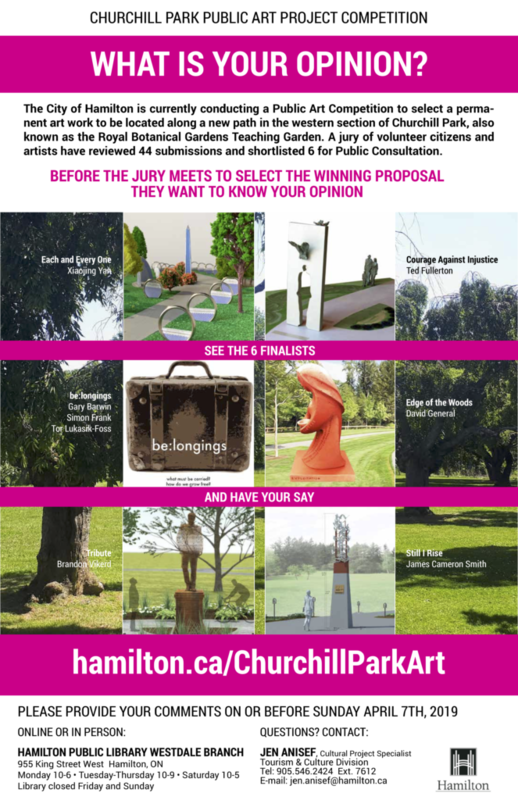 $200,000 has been allocated by the City for an art installation in Churchill Park (between the Aviary and Ravine Road). Six submissions were short-listed from 44 submissions by a citizen jury and now the City is accepting comments from the general public until April 7th ahead of the final selection. You can submit your comments via an on-line survey (link below) or via email to Jen Anisef. Descriptions of the project are available in the survey and at the Westdale Library. 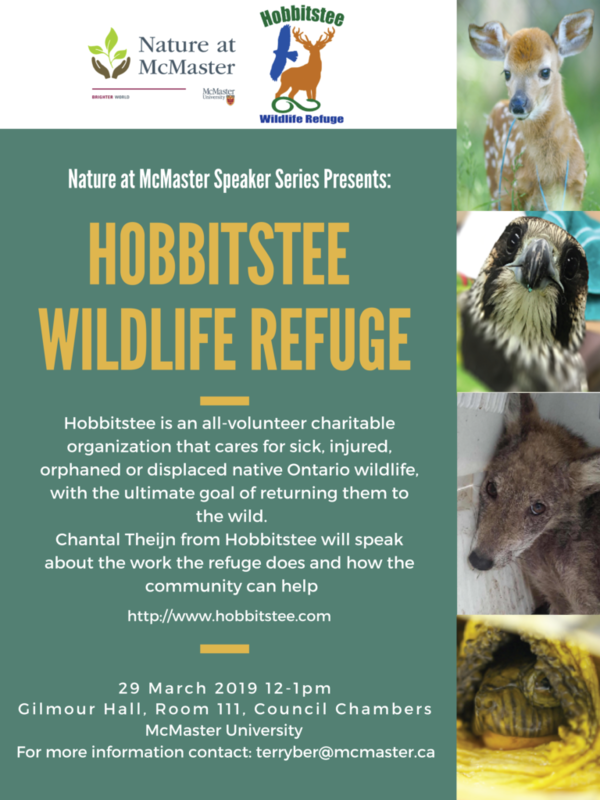 Hobbitstee is an all-volunteer charitable organization that cares for sick, injured, orphaned or displaced native wildlife. 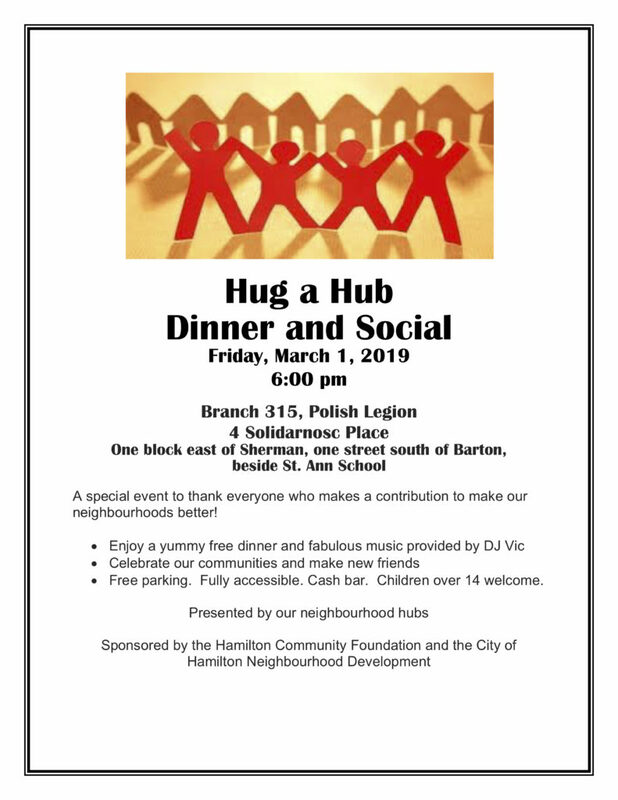 Chantal Theijn will speak about the work the refuge does and how the community can help. The City of Hamilton began a study of pedestrian, vehicle and cyclist traffic in Westdale in the Spring of 2018, using funds from the Ward 1 area-rating funds allocated by pubic voting. There was a Public Information Consultation at St. George’s Church in June, 2018 and on March 4th a draft of recommendations was presented to AWWCA members at our monthly board meeting. Click here to see an overview and two maps: the first shows problems identified by residents and studies of accident reports, speed and volume records, and walkabouts; the second show a draft recommendation of possible solutions. Comments may be sent to Bryan Purins, City of Hamilton Traffic-Safety Technologist, until Monday March 11th. A second PIC will be held in Westdale in April or May. If you are an AWWCA member and would like to attend, please email info@awwca.ca before February 18th. There is no charge for attendees. 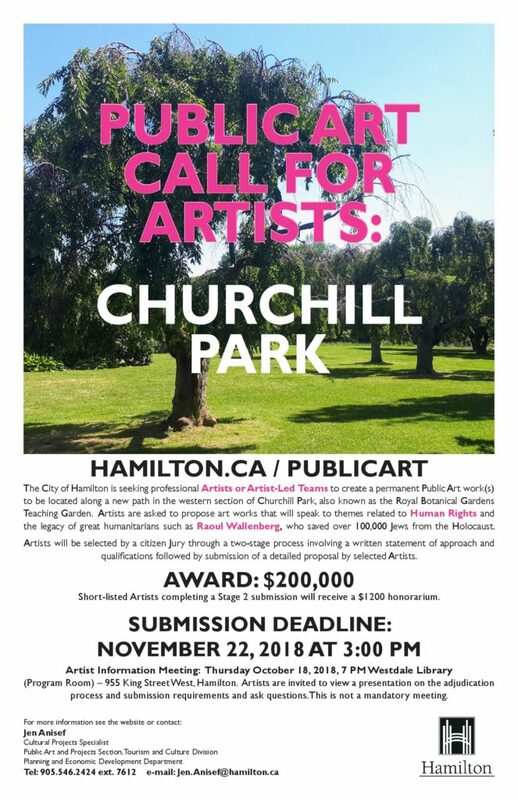 The City of Hamilton is seeking professional Artists or Artist-Led Teams to create a permanent Public Art work(s) to be located along a new path in the western section of Churchill Park, also known as the Royal Botanical Gardens Teaching Garden. Artists are asked to propose art works that will speak to themes related to Human Rights and the legacy of great humanitarians such as Raoul Wallenberg, who saved over 100,000 Jews from the Holocaust. Artists will be selected by a citizen Jury through a two-stage process involving a written statement of approach and qualifications followed by submission of a detailed proposal by selected Artists. Short-listed Artists completing a Stage 2 submission will receive a $1200 honorarium. Artist Information Meeting: Thursday October 18, 2018, 7 PM Westdale Library (Program Room) – 955 King Street West, Hamilton. Artists are invited to view a presentation on the adjudication process and submission requirements and ask questions.This is not a mandatory meeting. There’s quite a bit to digest and no-one on the board has had the chance to go over this thoroughly – we are eager for your comments. Community members are invited to join a discussion about the future of the Binkley United Church property at 1570 Main Street West. We are asked to “RSVP ASAP”; contacts and more information below. Binkley United Church is currently engaged in contacting local community members, service providers, stakeholders and municipal representatives to help us explore community needs and possibilities as we consider options for the redevelopment of our church property at 1570 Main Street West in Hamilton. Our project team is hoping that you would like to be involved in discussing with other community partners the local and municipal needs and potential impacts this redevelopment could address. 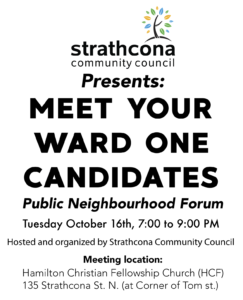 We invite you to join us for a Community Roundtable at Binkley United Church on Thursday, October 4th, 2018 from 9:00 a.m. to 1:00 p.m. The following letter was read by the Ward One Councillor’s Administrative & Constituency Assistant, Nikola Wojewoda, at the AGM on behalf of Aidan Johnson. Sadly, illness prevents me from attending our AWWCA AGM tonight. But I wanted to send a few words of report. First of all: Thank you to our hard-working AWWCA executive, and particularly our leader, Ira Rosen, for a great year of service. The AWWCA does tremendous work, and we cannot thank our executive enough. It has been a great year for Ward 1, and for Westdale and Ainslie Wood specifically. 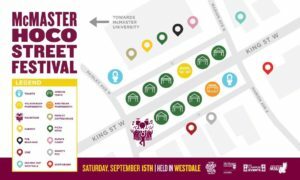 McMaster and the Westdale Village BIA will hold the inaugural Homecoming Street Festival in Westdale Village on Saturday, September 15h starting at 10 am. The street fest will feature live music and a DJ, along with free give-a-ways from McMaster Athletics, MSU Campus Events and the McMaster Alumni Association. In addition, the street will be lined with tents offering students goodies and samples from a host of vendors. Licensed patios will be open up and down the street, and multiple themed photo booths will be on site. 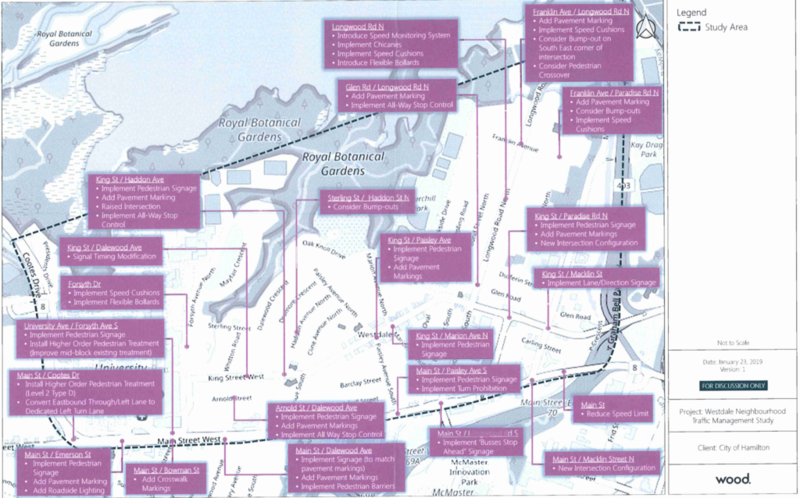 This is also the first year in which Homecoming has been scheduled to coincide with SuperCrawl, so we may well see a very different pattern of festivities than in past years.